Arranging a hen party doesn’t have to be stressful! Our hen party spa days offer the perfect day of pampering before your evening arrangements, or for a much needed wind down the day after! We have lots of different luxury spa days available, from our popular ladies days, to our champagne spa day and relaxation days. Based in the heart of the Suffolk countryside, our 5 bubble rated spa has all the facilities you could need! Our luxurious hydrotherapy pool offers five different water experiences with underwater lounges to kick back on whilst you feel the tension in your shoulders melt away! Your party can also enjoy our spacious outdoor rooftop hot tub. The perfect location to enjoy on a sunny day with a glass of something fizzy. After our unique water experiences, why not warm up with our luxurious thermal area and hammam table? Enjoy our relaxing steam and sauna rooms whilst you let your stresses drift away. We also have plenty of comfortable areas to relax and take a lie down. With our decadent relaxation room, you will be greeted with soft music, lighting and blankets to snuggle under whilst you shut your eyes for a rest. We have an extensive range of treatments available for our spa days. Your hen party can choose from a range of days that include facials, massages, body scrubs and detox rituals! As well as our luxurious spa facilities and treatments, our spa lounge also offers the perfect surroundings to stop and enjoy a spot of lunch! From paninis, to wraps and sharing platters, your hen party can enjoy a delicious lunch! We also offer champagne, wine, fresh fruit juice, smoothies and hot drinks to accompany throughout your day. 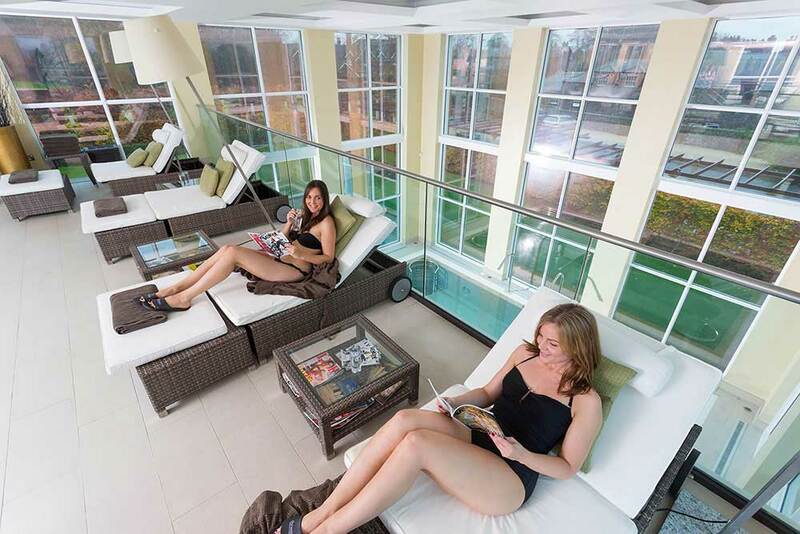 Find out more about our various spa days here, or phone us on 01638 676130 to find out more!